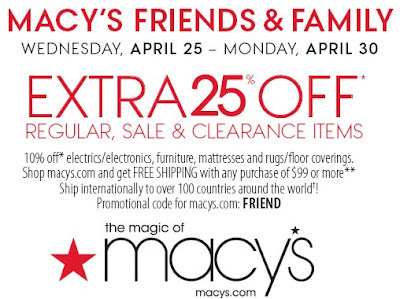 Right in time for Mother's Day gift shopping, Macy's is offering an extra 25% off most regular, sale, and clearance items. So what will you get Mom this year . . . birthstone jewelry, a new handbag, a luggage set for her upcoming vacation? If you shop online, you can also snag Free Shipping when your order totals $99 or more! Remember to come back and tell me what you ended up buying for Mom (and yourself).